I've stayed away from writing personal or creative pieces on this blog - which is meant to be a professional blog about grammar and writing - and not about my life. But tonight I'm inspired by a good friend of mine who writes in her professional and creative blog almost every single day. When I want a cozy read - about spirituality and bread-baking, poems, higher education, or the wonders of literature, I read her blog. Three weeks ago, a small, four-legged change came into my life. Mugsy or Mr. M - a Jack Russell/Rat Terrier mix - formerly lived with some family members who had to get rid of him because they were moving. They're happy that he's still in the family and I feel a bit like Daddy Warbucks or Aunt Polly or Marilla Cuthbert - or any other accidental parents of orphans. (Annie, Pollyanna, and Anne of Green Gables, for those of you keeping track.) Like those fictional orphan-parents, my days have shifted and I'm doing what I thought I'd never want to do at this stage in my life - love something that will one day die. And here I am. I can't be a workoholic anymore. Mr. M won't let me. 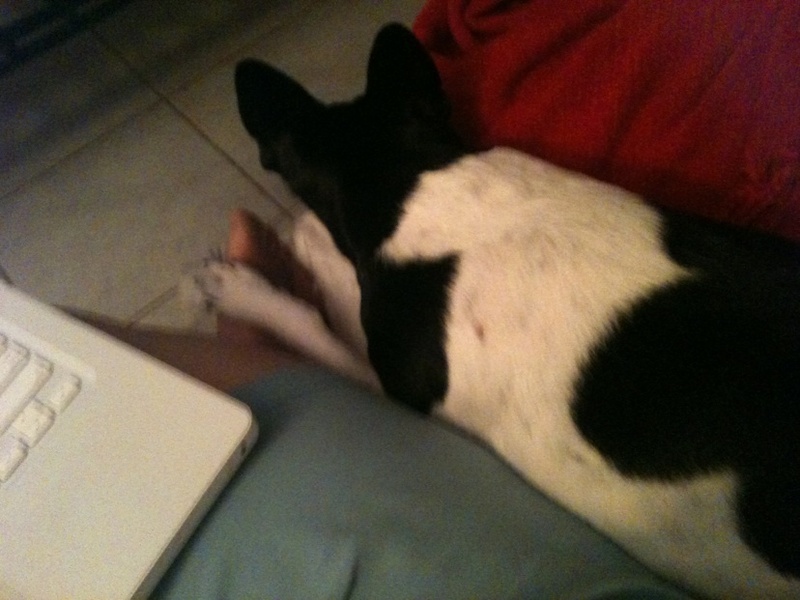 If I try, he climbs next to me and flings his black-and-white body across my laptop keyboard. If I ignore him, he lets out a high pitched whine. If nothing else works, he runs to get his squeaky-toy and bats it around, eventually tossing it next to me on the couch and then he stares at me with wide, round, black eyes: Are you done yet? He seems to say. And for that moment, I'm done. I save the work. I rename the layout. I close whatever I'm working for ten minutes or one whole hour and I devote myself to the task of giggling on the floor with a six-year-old dog who thinks he's a puppy. He rolls, he barks, he gleefully follows me through the house. I never thought I'd have another dog after the one that died two years ago, and like any true bachelor, I'm set in my ways. Or so I thought. Mr. M has made me a happier person in less than a month - who knew that I'd be working less and walking outside more? And with this little guy?